Rahul Sharad Dravid (born 11 January 1973) is a former Indian Cricker and captain of the Indian Test and One Day International teams. Dravid was honoured as one of the top-five Wisden Cricketer of the year in 2000.Dravid was also awarded the ICC Player Of The Year and the Test Player of the Year at the inaugural awards ceremony held in 2004. Dravid also holds the record of having taken the most number of catches in Test matches. On 9 March 2012, he announced his retirement from international cricket. On 7 August 2011 after getting a surprise call to play in ODI series against England he declared his retirement from One Day Internationals and T20. Popularly hailed as "The Wall of Indian cricket", Dravid is regarded by many to be one of the greatest batsmen in the history of the game. Dravid holds multiple cricketing records. He is only the second player, after Sachin Tendulkar , to reach 13,000 runs in Test cricket.On 14 February 2007, he became the sixth player overall and the third Indian (after Sachin Tendulkar and Saurav Ganguly), to score 10,000 runs in ODI cricket in cricketing history. He is the first and only batsman to score a century in all ten Test playing nations. With more than 200 catches, Dravid currently holds the world record for the most number of catches in Test cricket.Dravid has also been involved in more than 80 century partnerships with 18 different partners and has been involved in 19 century partnerships with Sachin Tendulkar â€“ a world record. On 24 November 2011, He became the second international player to reach 13,000 runs in Test Cricket only after Sachin Tendulkar. On 14 December 2011, he became the first non-Australian cricketer to address at the Bradman Oration in Canberra. Dravid has been bowled 55 times in Test cricket, going past Allan Border's previous record of 53. 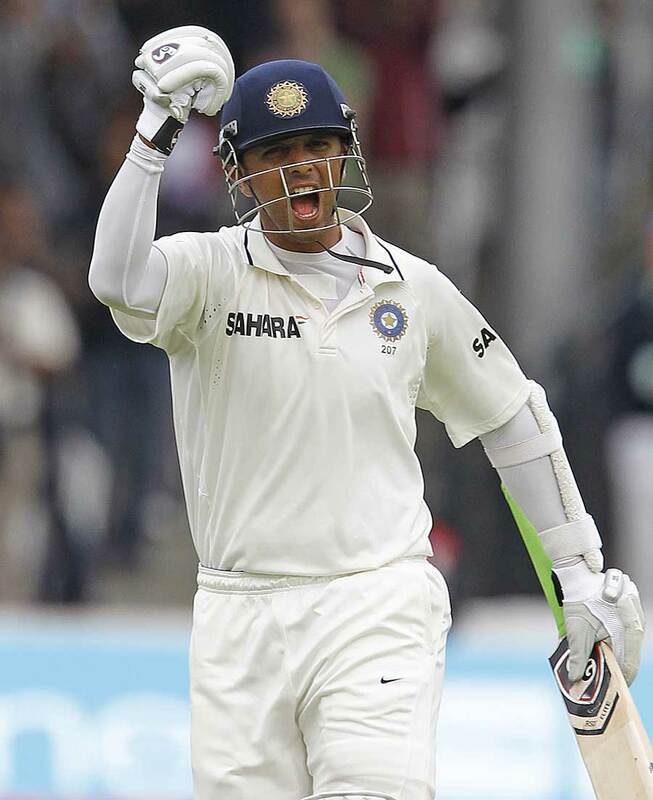 On 9 March 2012, Rahul Dravid announced his retirement from international and first class cricket. Dravid made the announcement with the BCCI president, N Srinivasan and former captain Anil Kumble at a press conference in Bangalore. He is however slated to appear in the 2012 edition of the Indian Premier League as captain of the Rajasthan Royals. - Test debut v England at Lord's - June 1996. - ODI debut v Sri Lanka at Singapore - April 1996. - Dravid is one of the top-ranked batsmen in world cricket. - Captained India from October 2005 until September 2007. - He averages over 50 in Test cricket and is third in the list of Indians with the most centuries. - Dravid's only Test wicket was that of Ridley Jacobs in the fourth Test against the West Indies during the 2001/02 series. -He was involved in the largest batting partnership in ODI history, when he and Sachin Tendulkar scored a World Record 331. -During his international career he scored four centuries in successive innings, and hit four double-centuries in the space of 15 Tests. - Whilst renowned for his long Test innings, he was the top scorer in the 1999 World Cup with 461 runs in 8 innings. - He is the sixth batsman in the world to score 10,000 ODI runs. He holds the exact same record in Tests. - Holds the record for the most catches in Test cricket for a non-wicketkeeper. - ICC Test Player of the Year and ICC Player of the Year 2004. Career Span - 1996 to 2012. Career Span - 1996 to 2011. Last edited by Guitarist; 01-26-2013 at 08:09 PM. Rajasthan Royals - IPL Team. The team's mascot is a lion. The team anthem, 'Halla Bol' is sung by Ila Arun. Rajasthan Royals is an Indian Premier League franchise based in the city of the Jaipur. It is currently captained by former Indian captain Rahul Dravid.They won the inaugural edition of the Indian Premier League under the captaincy of former Australian spin-legend Shane Warne. In 2010, they were terminated by the BCCI for a brief period for violations in terms of agreement but were allowed to play in the league soon after the Board lost the case in the Supreme Court. Winners of the 1st edition of IPL. Last edited by Guitarist; 05-18-2012 at 06:22 PM. Dravidinu thread okke undakkiyathu nallathu thanne. pakshe Sachin Ganguly pole oru celebrity status dravidinilla ennu thonnunnu. But Dravid is the technically best player in the world! True gentleman, and a legend!! vere aarum mind cheyyilla, especially towards the end of his career. You are giving due respect to Sachin Tendulkar. Rahul Dravid also deserves the same respect. Its shame that no one gives him the deserved respect! !